Direct Sequel For Final Fantasy XIII? For the uninitiated, Final Fantasy XIII might seem like the sequel to Final Fantasy XII. It's not. 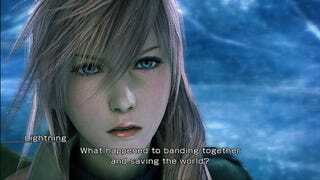 Each game is its own title, so if there was a FFXIII sequel, it would be FFXIII-2. When asked about the chances of a direct FFXIII sequel, the game's producer Yoshinori Kitase replied, "In the past three years we worked both on the world and on the various systems. Creating these systems isn't very glamorous and can frankly be a bit boring." Okay, go on. "If we could do a XIII-2," the producer added, "we could direct all our attention to the story and refine what we have already built." Square Enix has a precedent for this. FFX-2, for example.